Also known as: "My lack of ability to work on only one thing at a time..."
Alright, maybe it's not the most exciting thing to look at, but I really love it. Ever since I got this yarn from knitpicks (Felici sock yarn in Atmosphere) it has been begging me to pick it up and start knitting. 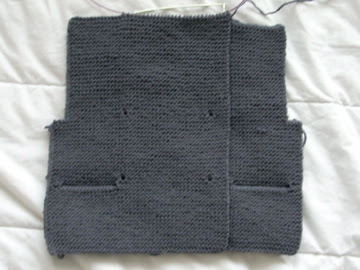 After three attempts to start it (correcting gauge, or the ribbing on the cuff) this is what I have. A cuff. Well, and a bit of the leg, but hey! it's something! I am going to call these my Road Trip Socks, partly because it sounds better than "my blue stripey socks" and partly because I hope to get a bulk of the knitting done while on the road during my tour. My orchestra is touring in Minneapolis and Chicago, which means a lot of travel time to relax and knit away - sweet! The first time I saw this yarn I knew I needed it for myself. 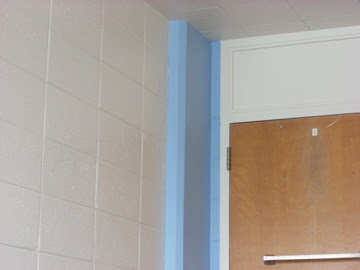 I loved the colors (blue and white, how can you go wrong?) 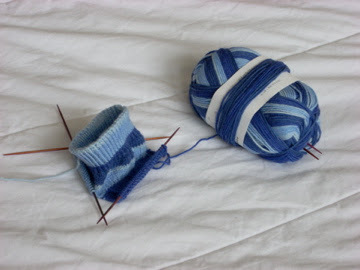 In fact, after beginning the sock, I realized just how much of these colors are in my dorm room right now. 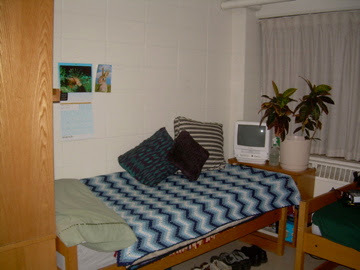 My bed! Hey, don't those stripes look familiar? No wonder I loved that sock yarn. This is a blanket my sister crocheted for me as a graduation present. Thanks sis! Hey cool! 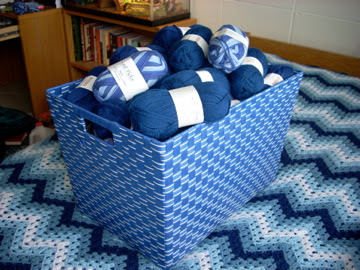 My blue and white yarn basket, overflowing with blue yarn... how predictable. OK, I think you get the point. I love blue (and white). I may even venture to say that it is my favorite color (but it's hard for me to be sure, being color blind and all). In any case, my wonderful Road Trip Socks are bound to be amazing and I can't wait until I can wear them. And just so you don't think I have completely ignored my other project (see how I used the singular, pretending that I don't even have hideously ugly green socks waiting to be finished? ), here is an update on the Duffle Coat for my baby nephew Xander. I just finished the front last night (after taking a four day break from working on it) and now have to do the hood, the sleeves and a bit of *gasp* seaming. I was hoping to get this done before I went on tour so that I could give it to my nephew while in Minneapolis, but that doesn't seem likely as I am heading out tomorrow morning. Speaking of nephews, there has been a new addition to my family! Another sister has had a baby boy, Darby - born on February 10. Don't worry though, I already have the yarn, needles, and pattern all ready to go to make a nice warm sweater for him as well (see, I think ahead like that sometimes). Here's hoping that I will have some FOs and new projects to show in the weeks to come! YOU HAVE AN EFFING BLOG?! I can't believe you didn't tell me!! Pretty sure we are color soulmates because that's exactly what my stash looks like. blue blue blue blue...oh, and some more blue. craziness. How is it that this is my first time checking out your blog? Man, I have a LOT of reading catching up to do. Once I have finished this, I'm going to know more about your knitting than I do about mine! I'm commenting on this entry in particular because I was wondering if your sister still had the pattern for that crocheted blanket. It looks identical to the one on my bed (baby-sized, borrowed from my roomie) and I've been looking for a similar pattern so that I could make a man-sized one. Your sister's may just do the trick.